John LaFarge (March 31, 1835 – November 14, 1910) was one of the most innovative and versatile American artists of the nineteenth century. While recognized largely for his paintings, stained glass, and interior decoration, LaFarge also drew attention during the American Renaissance as an illustrator, muralist, world traveler, art critic, author and close friend of prominent men, including Henry James. He was the first American to devote himself extensively to mural painting and his stained glass windows were unprecedented. A founder and leader of the American watercolor movement by the late 1870s, LaFarge used watercolor to make studies for illustrations and decorative projects, to record his travels, and to paint floral still-life exhibition pieces. He was an organizer of the Metropolitan Museum of Art in New York City and founder of the Society of American Artists and the Society of American Mural Painters. As a result of the great variety of his work it has been difficult to assess his importance overall, but it is thought that as each work must be judged individually then he can be called a quintessential "Renaissance man" of the American Renaissance. Born in New York City, New York, of French parentage, he grew up speaking several languages in a home full of books and paintings. His interest in art was inspired early by his grandfather, the minatiurist Louis Binsse de Saint-Victor, who had him accurately copy engravings at age six. Later as a teenager at Columbia Grammar School, he was taught by an English watercolorist and a few years later he studied drawing with Regis-Francois Gignoux, who had also taught George Innes. During his training at Mount St. Mary's University and St. John's College (now Fordham University) his main interest was the study of law until he left for Europe on his Grand Tour. There he met his cousin, Paul de Saint-Victor with whom he enjoyed the most brilliant literary society of the day. In France he also briefly studied painting with Thomas Couture, visited French medieval cathedrals and then traveled in Germany, Belgium and Denmark where he copied drawings in the printrooms of museums. He was much influenced by the Pre-Raphaelites led by John Ruskin, who focused on the importance of art being morally and spiritually uplifting. In the autumn of 1857 he returned home to a seriously ill father who would die a year later. Soon afterwards LaFarge became friends with the architect Richard Morris Hunt, a brilliant student from L'Ecole des Beaux-Arts in Paris, who recommended him to his brother William Morris Hunt, who was looking for pupils to teach painting. He'd also studied with Couture and had been influenced by Jean-François Millet and the Barbizon school and its principles. LaFarge felt that it was a chance to study painting more seriously. Even his earliest drawings and landscapes, done after his marriage in 1861 to Margaret Mason Perry, sister-in-law of Lilla Cabot Perry, show marked originality, especially in the handling of color values and his use of Japanese influences. While the French Impressionists were also fascinated with Japanese art LaFarge had actually spent time in Japan and became a pioneer in using its techniques. LaFarge's inquiring mind led him to experiment with color problems, especially in the medium of stained glass. LaFarge became the greatest innovator in modern stained glass history. He was the first to develop opalescent glass for windows and pioneered the use of thin copper wire or foil to replace heavy lead lines, techniques that made possible the work of Louis Comfort Tiffany. Though Tiffany’s financial resources and commercial inclinations made him far better known, it was LaFarge who was recognized then and since as the great innovator in the field. 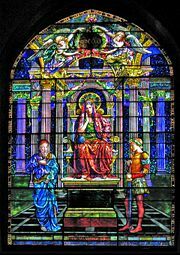 In the early 1880s, LaFarge received a number of very prestigious stained glass commissions, including the houses of William H. Vanderbilt and Cornelius Vanderbilt II in New York, the Darius Ogden Mills house in New York, Harvard University’s Memorial Hall, and windows for Trinity Church in Boston. By 1885, however, his decorating career was dealt a severe blow by legal trouble with the directors of his firm, the LaFarge Decorative Art Company, which resulted in his arrest for grand larceny. Although the charges were soon dropped, the stigma of arrest, which made front-page news, attached to LaFarge until at least the end of the decade. By the early 1890s, however his clientele improved, with commissions like Judson Memorial Church, a second major window, call Wisdom, for the Ames family’s Unity Church in North Easton, Massachusetts (the earlier window was called, The Angel of Help), an impressive Resurrections window for the First Congregational Church of Nethuen, Massachusetts, and a pair of large allegorical windows depicting Spring and Autumn for William C. Whitney’s Long Island estate. Between 1859 and 1870, he illustrated Tennyson's Enoch Arden and Robert Browning's Men and Women. In 1876 he began receiving commissions to decorate the interiors of churches, mansions, and private and public buildings that were being constructed or refurbished in response to post-Civil War prosperity and urban growth. Breadth of observation and structural conception, and a vivid imagination and sense of color are on display in his mural decorations. His first work in mural painting was done in Trinity Church, Boston, in 1873. His decorations in the Church of the Ascension (the large altarpiece) and St. Paul's Church, New York soon followed. For the State Capitol at St. Paul he executed, in his seventy-first year, four great lunettes representing the history of religion, and for the Supreme Court building at Baltimore, a similar series with Justice as the theme. In addition there are his vast numbers of other paintings and watercolors, notably those recording his extensive travels in the Orient and South Pacific. The earliest recorded exhibition of paintings by LaFarge was in Boston in 1878. There were 48 paintings in the exhibition, all but four of them done by LaFarge. The other four were from his own collection. This exhibition and the ensuing auction resulted in LaFarge's first public recognition as a landscapist. In the late 1850s and early 1860s, LaFarge became a pioneer in collecting Japanese art and incorporating Japanese effects into his work. He may have purchased his first Japanese prints in Paris in 1856, and this interest was probably encouraged by his marriage in 1860 to Margaret Perry, niece of the Commodore who had opened Japan to the West. By the early 1860s, LaFarge was not only collecting Japanese prints, but was also making use of Japanese compositional ideas in his paintings to create effects which looked strange, empty, and unbalanced by Western standards. In 1869, LaFarge published an essay on Japanese art, the first ever written by a Western artist, in which he particularly noted the asymmetrical compositions, high horizons, and clear, heightened color of Japanese prints. In 1887 and 1888, following his trip to Japan, La Farge executed a series of monochromatic ink drawings based on photographs that he had purchased or that Henry Adams had taken for him. The drawings were then made into wood engravings for use as magazine illustrations. In An Artist's Letters from Japan he reported that of all the art he saw there he was most moved by the images of the bodhisattva Kannon "When shown absorbed in the meditations of Nirvana." He and Adams took a second trip to Asia in 1891, traveling to the Buddhist temples of Ceylon. His labors in almost every field of art won him the French Government the Cross of the Legion of Honor and membership in the principal artistic societies of America, as well as the presidency of the National Society of Mural Painters from 1899 through 1904. Enjoying an extraordinary knowledge of languages (ancient and modern), literature, and art, by his cultured personality and reflective conversation he greatly influenced all who knew him. Though naturally a questioner he venerated the traditions of religious art, and preserved always his Catholic faith and reverence. The critic Royal Cortissoz said of LaFarge: "I have heard some brilliant conversationalists, Whistler among them, but I have never heard one remotely comparable to LaFarge." Henry Adams said of him, "LaFarge was a great man-this is rarely true of artists, LaFarge needed nothing but his soul to make him great." In 1904, he was one of the first seven chosen for membership in the American Academy of Arts and Letters. LaFarge died in Providence, Rhode Island, in 1910, the year of his large retrospective exhibition at the Museum of Fine Arts, Boston. LaFarge was interred in the Green-Wood Cemetery in Brooklyn, New York. His eldest son, Christopher Grant LaFarge, was a partner in the New York-based architectural firm of Heins & LaFarge, responsible for projects in Beaux-Arts style, notably the original Byzantine Cathedral of St. John the Divine, the Yale undergraduate society, Saint Anthony Hall (extant 1893-1913) and the original Astor Court buildings of the Bronx Zoo. His son Oliver Hazard Perry LaFarge I became an architect and real estate developer. Part of his career in real estate was in a Seattle partnership with Marshall Latham Bond, Bond & LaFarge. During the year 1897 to 1898 Seattle real estate which had gone through a bubble was in a slump. The partners left and participated in the Klondike Gold Rush. Among the camp fire mates at Dawson City during the fall of 1897 was Jack London who rented a tent site from Marshall Bond. In Seattle the Perry Building designed after LaFarge returned is still standing. Later on in his life O. H. P. LaFarge designed buildings for General Motors. Another of his sons, John LaFarge, S.J. became a Jesuit priest and a strong supporter of anti-racial policies. He wrote several books and articles before the war on this subject, one of which caught the eye of Pope Pius XI who summoned him to Rome and asked him to work out a new encyclical, Humani Generis Unitas, against Nazi policies. John LaFarge completed work on the encyclical, but unfortunately it reached the Pope only three weeks before the pope's death. It remained buried in the Vatican Archives and was only rediscovered a few years ago. His most famous books are The Manner is Ordinary (1953), Race Relations (1956), and Reflections on Growing Old (1963). On the other hand, in the 1960s, his Newport paintings became for some, 'avant-guarde' for their period and were praised as such. It was found also that LaFarge preceded many of the French developments; collecting Japanese prints long before others, such as Whistler, etc., making plein-air paintings before the Impressionists and painting in Tahiti, one year before Paul Gauguin. Other innovations anticipated modernist Europeans; a new school of wood engraving, the invention of opalescent stained glass and a type of art criticism utilizing new discoveries in psychology and physiology. As a conservative he was a revivalist and his religious painting was unheard of in American tradition. Called an "eccentric conformist," this oxymoron seemed to describe one of the most creative minds in American art, seemingly a bridge between the old nineteenth and the new twentieth centuries. During his life, he maintained a studio at 51 West 10th Street, in Greenwich Village, which today is part of the site of Eugene Lang College. ↑ 2.0 2.1 Crossroads of Culture The Angel of Help Thedreaming.info. Retrieved March 18, 2009. ↑ John La Farge and the windows of Judson Memorial Church Judson.org. Retrieved March 18, 2009. ↑ Henry A. LaFarge, 1983, John LaFarge Metmuseum.org. Retrieved March 18, 2009. ↑ John LaFarge and the 1878 Auction of His Works Jstor.org. Retrieved April 17, 2009. ↑ John LaFarge Butlerart.com. Retrieved March 18, 2009. 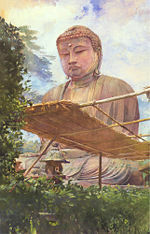 ↑ Thomas A. Tweed, The American Encounter with Buddhism, (1844-1912) Books.google.com. Retrieved April 17, 2009. ↑ The Reverend John LaFarge, S.J. Catholicauthors.com. Retrieved April 17, 2009. ↑ Kenneth T. Jackson. The Encyclopedia of New York City. (The New York Historical Society, Yale University Press, 1995), 650. An Artist's Letters From Japan. 2007. Reprint Services Corp. ISBN 9780781236836. Adams, Foster, La Farge, Weinberg, Wren and Yarnell. John La Farge. Abbeville Publishing Group (Abbeville Press, Inc.), New York, NY: 1987. ISBN 0896596788. Cortissoz, Royal. 1971. John la Farge: A Memoir and a Study. Library of American Art. New York: Kennedy Graphics + Da Capo Press. ISBN 0306714051. Jackson, Kenneth T. The Encyclopedia of New York City. The New York Historical Society, Yale University Press, 1995. Tweed, Thomas A., The American Encounter with Buddhism, 1844-1912: Victorian Culture & the Limits of Dissent. UNC Press, 2000. ISBN 0807849065. Waern, Cecilia. 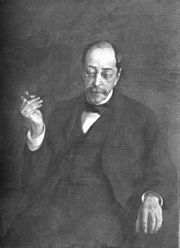 John La Farge: Artist and Writer. London: Seeley and Co. Limited, 1896. OCLC|185172480. All links retrieved May 18, 2018. Winslow Homer: The Obtuse Bard Obtusebard.org. This page was last modified on 18 May 2018, at 19:47.